Caffè Vivo is part of the 21 Hospitality Group and a restaurant I've visited a fair few times now. It's an established restaurant along the Quayside where you're always guaranteed top notch food, fantastic service and a warm and friendly atmosphere. Steve and I have often eyed up their BYO nights which take place on the first Wednesday of every month but due to his shift patterns and our lack of mid-week babysitters, we've never been able to make it so I decided to take my friend Kelly for a much-needed catch up instead. 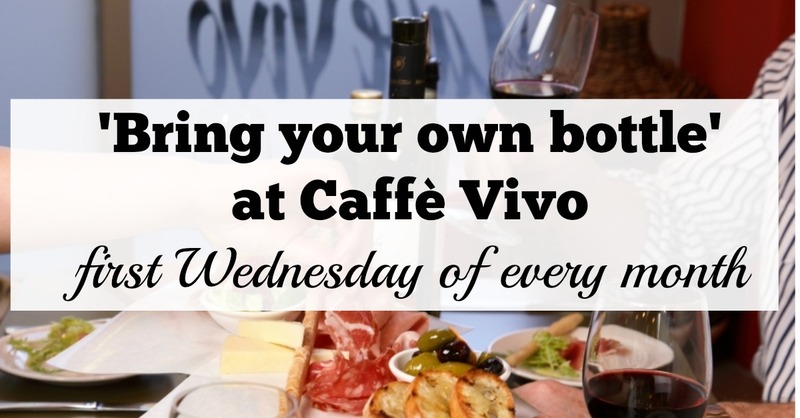 Caffè Vivo is a super welcoming restaurant anyway and on their BYO nights you are welcome to bring a couple of bottles along with you. You aren't subject to any corkage charges and the staff are happy to provide wine coolers, the correct glasses and will even open and pour your wine too. I wasn't very prepared - Steve and I are not the sort of people who have a huge wine collection - we're more likely to drink something within an hour of purchase and would never have the willpower to keep a nice bottle 'for best' so I popped into Sainsburys on Northumberland Street to pick something up before heading down to the Quayside. I was hoping to treat Kelly and I to a bottle of nice Champagne, however annoyingly, Sainsburys didn't have any in their chiller so I settled for a bottle of Prosecco instead. I suppose it was more in-keeping with the Italian style of our evening. A bottle of Prosecco set me back £10.99 in Sainsburys whereas a bottle is £28.90 if purchased from Caffè Vivo so we'd already made a massive saving. If we didn't have work the following day or we were celebrating, I'm pretty sure we would have brought two bottles along with us. There's no denying it always feels weird walking into a restaurant with a carrier bag of wine. It definitely feels like you're breaking the rules (in a good way). 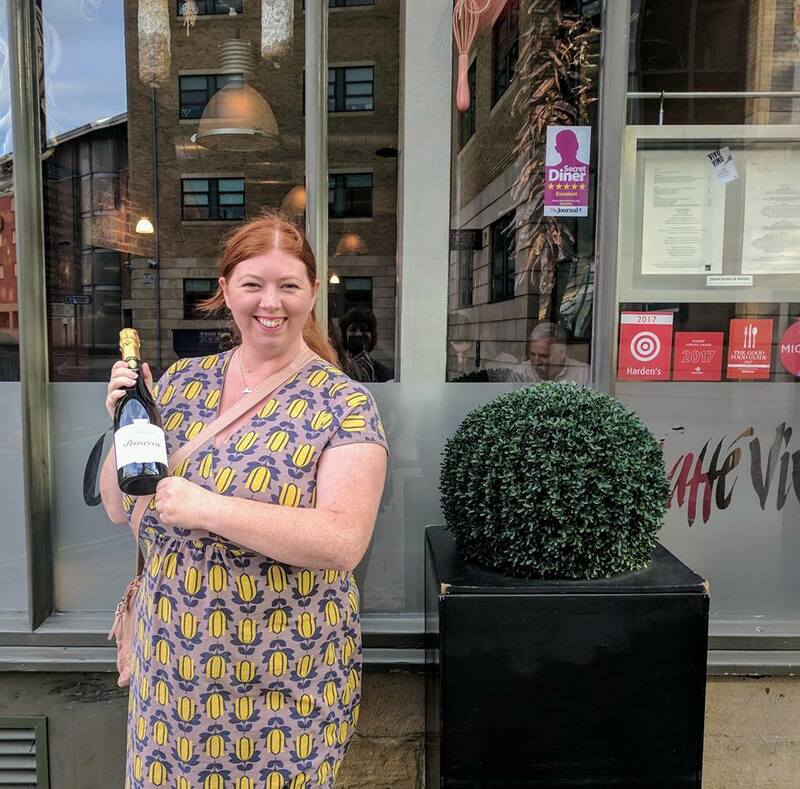 As a special bonus offer for June, we were provided with a voucher enabling us to return with a bottle of wine on another evening and only pay £5 corkage. Nice touch. Our lovely server spotted our Prosecco and ensured it was sitting in an ice bucket within minutes (maybe I could have bought that Champagne after all!). 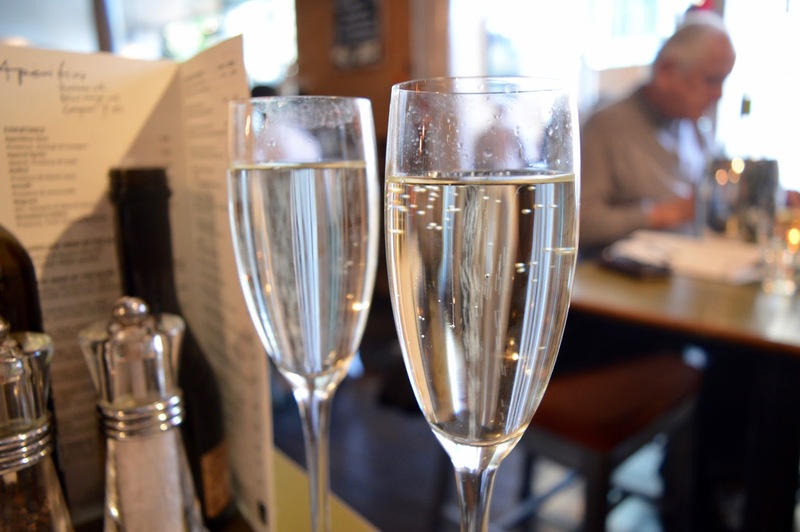 Our first glass was poured and we settled back and enjoyed some freshly baked bread whilst perusing the menu. I always study a menu before I visit anywhere and pretty much knew what I was going to order. I was tempted by some of the specials though and it turns out Kelly was too as she opted for the Garlic Prawns from the specials board. 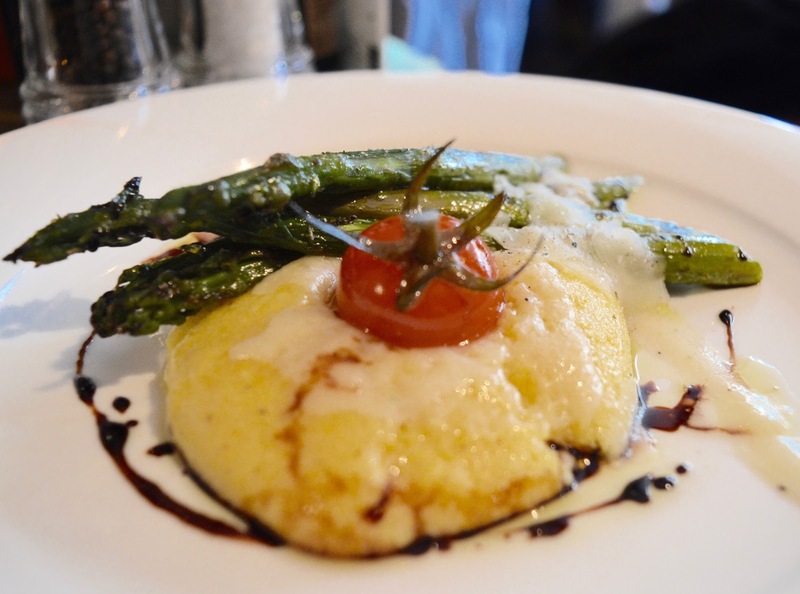 For me, it was the Char-Grilled Asparagus with Soft Polenta and Parmesan. Neither of our choices were particularly healthy but they were both hearty and perfectly cooked. Polenta can often be a little bland but mine was far from it and it had been seasoned perfectly too. 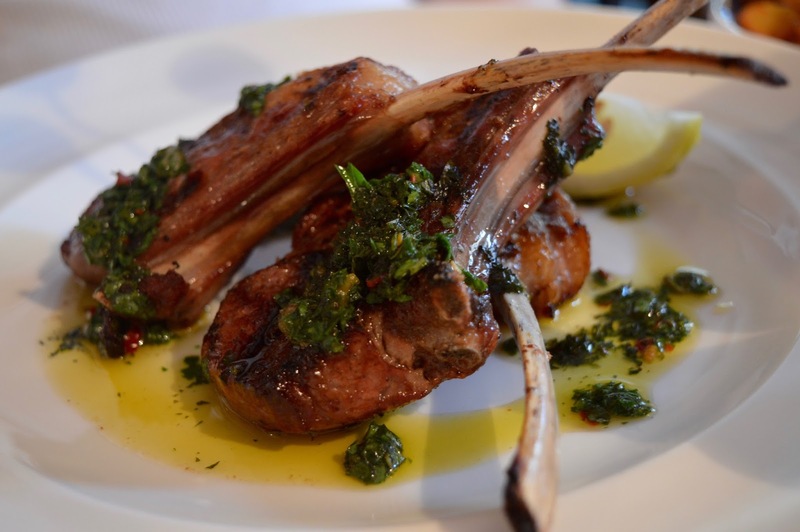 Onto the mains, and Kelly ordered Caffè Vivo's popular Lamb Chops which are served with rosemary roast potatoes. 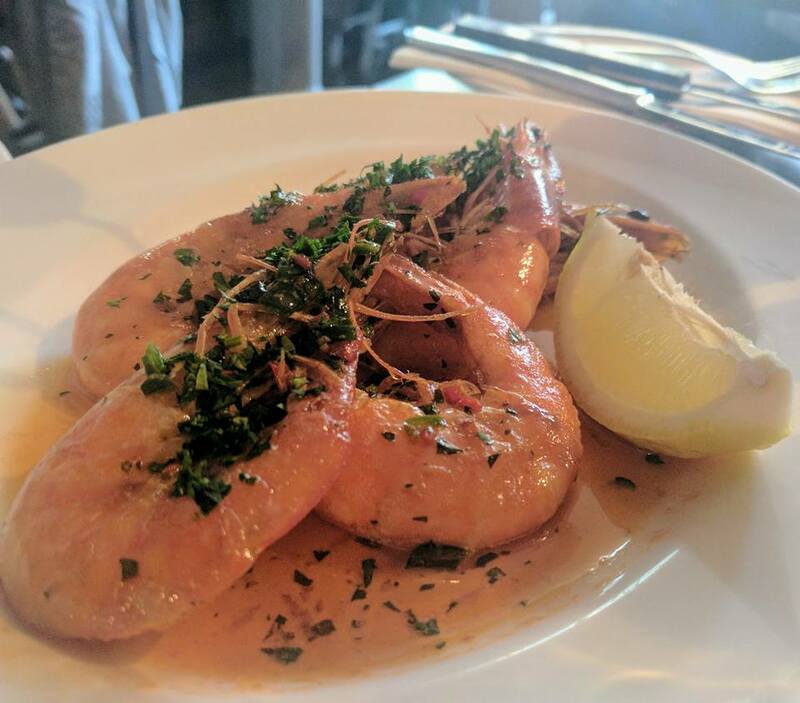 They are served pink (and your server will check if this is ok - if not, it's not a problem for them to be cooked through) and I have enjoyed this dish on a previous visit so can vouch for how delicious they are. Priced at £18.50, I think this dish offers very good value. 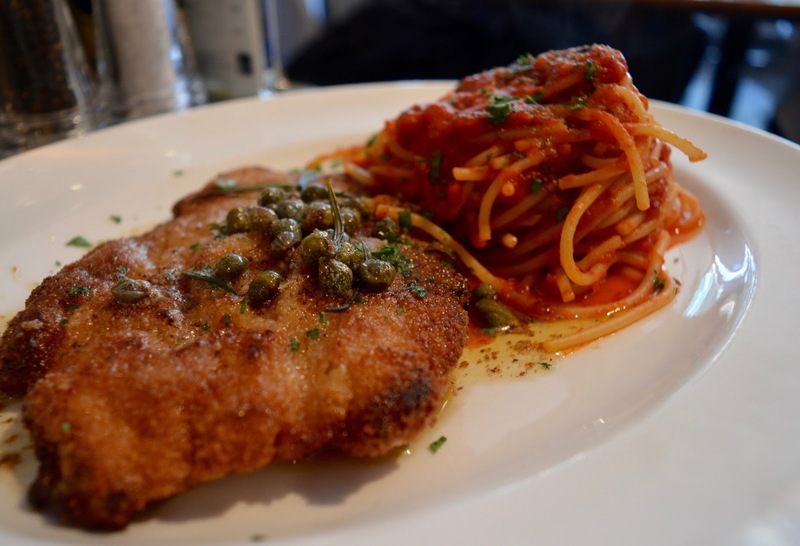 After enjoying the best ever Chicken Escalope at Enfields earlier in the week, I could not resist trying Caffè Vivo's version - Chicken Milanese served with Spaghetti Pomodoro. This is not the most photogenic of dishes and I have to say it was very messy to eat but I loved it. 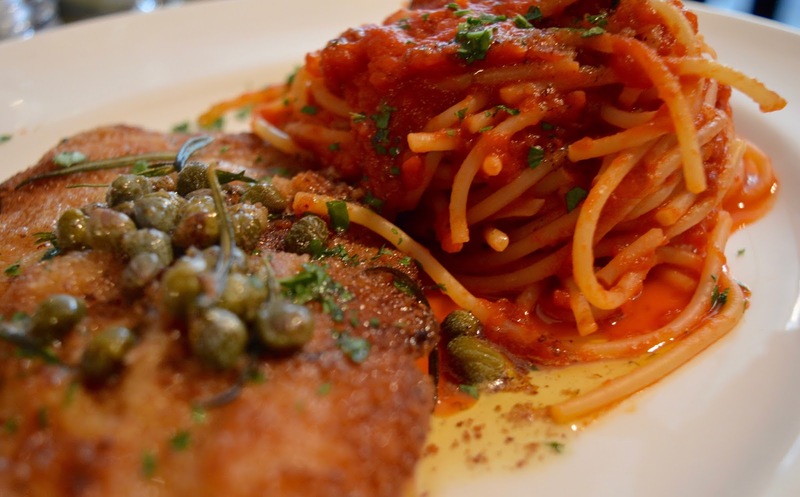 I'm not a big pasta eater and would usually choose a pesto based sauce over a tomato sauce but Caffè Vivo's tomato sauce is the best I've ever tried. It was beautiful and when I next visit I am definitely going to order a full pasta dish which is very unlike me. It was that good! Portions are definitely on the generous side but you are encouraged to enjoy a leisurely meal so there is no need to rush. It really is the perfect place to enjoy a proper catch up with your friends and family. Our server suggested a little respite before looking at the dessert menu which was welcome. I really wish I could have ordered a homemade Italian dessert as they all sound divine but there is no point in eating for eating sake so I settled for a mini dessert (chocolate and espresso mousse) and an espresso which is my new favourite way to end a meal and was perfect. Caffè Vivo always feels laid back, warm and welcoming to me but I think on their BYO evenings this is even more so the case. It's the perfect way to catch up with friends over good food and fizz or a nice bottle of wine you've been saving for a special occasion (if unlike myself you have willpower and are able to save wine for such occasions). Find out more via the Caffè Vivo website here. It was a lovely evening! Thank you for inviting me! Love the sound of BYO and I've only been to Caffe Vivo once .. one to add to my list! What a great idea! 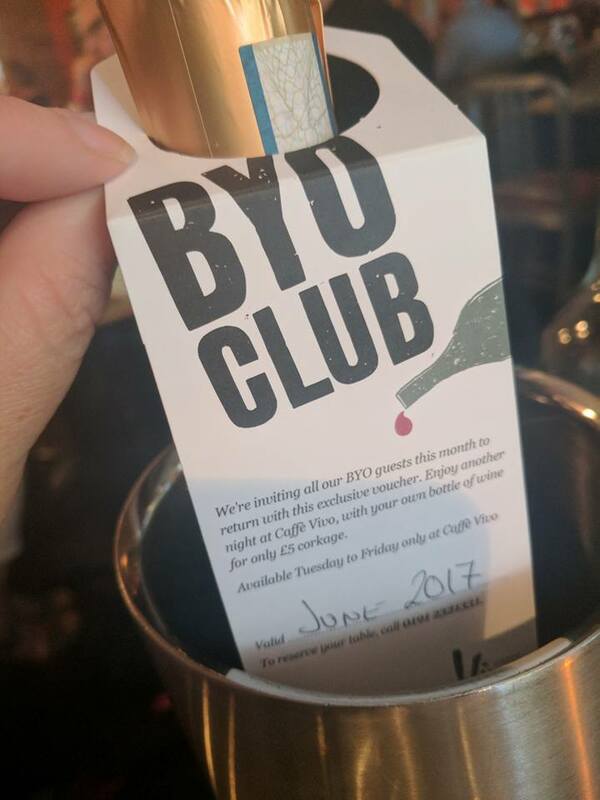 Love the byo idea. One bottle of prosecco is never enough for me! The food also looks amazing here!